• A history and a recipe book for lovers of marmalade • • The definitive account of the origins of marmalade • • The English Kitchen series •Marmalade is particularly British creation, even though its origins lie abroad, and its charms have been exported to the wider world. C. Anne Wilson’s book was first published in 1986 by Constable, reissued in Britain (Prospect) and the USA (Pennsylvania UP) in 2000, and now takes its place in Prospect’s ‘English Kitchen’ series. It offers a history of marmalade in Britain from its origins as a quince conserve in medieval times, through its first commercialization in Scotland in the 18th century, to its dominant place in the British jam cupboard and on the breakfast table in the modern era. The first edition has been updated to take account of most recent developments.“It really is a great pleasure to find one specific subject in the vast field of food history dealt with in a manner which can, for once, be properly described as definitive;… the result is a model,” was the introduction to one review.The history is buttressed by two dozen recipes drawn from old and modern sources. The illustrations are from old photographs, reproductions of catalogues, etc. Here is everything that a maker of marmalade, or a lover of the stuff, could need to feed his or her brain. C. Anne Wilson is one of Britain’s most celebrated food historians, her reputation established with Food and Drink in Britain (1973). She was formerly a librarian at Leeds University Library and has for many years organised the Leeds Symposium on English Food History. I’ve had The Book of Marmalade for a while now and have read it several times over. I love making marmalade and this book puts the whole process into historical perspective. Did you know that the original “marmalade” was made from quinces and that the name itself derives from the Portugese word for quince which was “marmelo”? Hence we make “marmelada” from “marmelo” - quince! Hallelujah, because I also make Quince Paste (membrillo for those of you who have eaten it in Spain) and knowing the history of a foodstuff tickles me pink! So, why do we now associate marmalade with Seville oranges? Well, for this we have the Arabs to thank and their road led to Rebecca Price who copied a recipe for ‘marmelett of oringes: my mother’s receipt’ into her own recipe book in 1681 and so on down the historical road to one Janet Keiller of Dundee who, at an unknown date in the eighteenth century, bought a load of Seville oranges cheaply from a storm-driven ship, turned it into marmalade using the sugar her husband stocked in his shop and sold it over the counter with such great success that the firm of James Keiller and Son was established to make and sell this confection commercially. Janet Keiller didn’t invent marmalade; she had access to recipes that were in circulation at the time, but she certainly played her part in popularising it. There are recipes, too, to try out and if you want to know all about marmalade as an aphrodisiac, here’s where you will find out all about it! Oh, and if you have a quince tree in your garden, look after it with tender, loving care and if you dont’ have one, plant one and, in time, you’ll be making wonderful quince jellies and cheeses. This review is from an older edition of this book. No food is more entrenched in the national psyche than marmalade. Hillary took it to the foothills of Everest; Frank Cooper have in their possession a tin of their marmalade carried in 1911 to the polar wastes by Scott. In the early 1900s the Empress of Russia and the Queen of Greece, daughters of Queen Victoria, had regular supplies of marmalade sent to them by Wilkins of Tiptree. Seville orange marmalade has been part of Britain’s culinary heritage for more than four centuries and yet its history is still being argued about. Some say the first marmalade maker was Janet Keiller of Dundee; others claim that it was introduced by Mary Queen of Scots. There is strong evidence that it may originate from Portugal where marmelada was made from the marmelo or quince. According to historian Anne Wilson, its origins go back to Roman and Greek times. 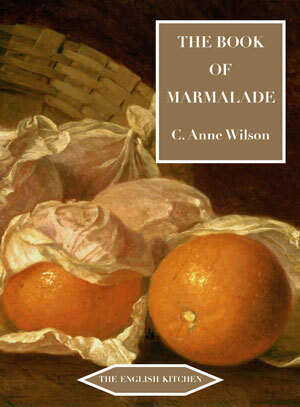 Her book about marmalade, first published in 1985 has recently been revised. So buoyant were the sales of marmalade that in 1985, to give it greater media coverage, a group of marmalade manufacturers launched National Marmalade Day, March 10, which celebrated the 500th anniversary of the earliest port record of the arrival of Portuguese marmelada in London. “Luxury” marmalades created for the premium gift market have taken their place alongside mustards and chutneys – and specialist marmalades with reduced sugar levels have become a big seller in health food shops. Whisky and brandy versions sell well to those who reckon that what you really need at breakfast is a taste of the hair of the dog. Baxters of Fochabers were the first to explore the liqueur market. They experimented for several years before launching, in 1952, a dark and intriguing product matured in Speyside whisky casks for five years. You might think that adding a nip of spirits to jam might be an easy process but as Anthony Blunt of Elsenham told Anne Wilson, his own experiments were accompanied by an element of farce. One day, the jam-boiling team was assembled in the low-ceilinged Boiling Room and the fruit and sugar were prepared. At the last minute, Blunt poured into the pans several bottles of brandy. All the staff gathered round to watch. The mixture was then potted off amid a certain amount of merriment. The next batch was prepared and, wincing at the cost, Blunt added several bottles of whisky. The air became filled with the fumes of alcohol and oranges. By this time the first batch was just cool enough to taste. Everyone tried it. Sadly no one could detect any difference. Again and again the experiment was repeated. More and more precious Dot bottles went into the boiling pans. Red faces shone in the steam. Blunt suddenly realised that not only had he run out of drink but also the staff, not to put too fine a point on it, were drunk! Later experiments were more carefully controlled with the fruit marinated in spirit and Elsenham liqueur marmalade went into production in 1962. I must confess that lemon, lime, ginger and grapefruit marmalades do not tempt me. I like my marmalade made with Seville oranges, coarse cut so that the aromatic bitterness of the peel dominates the flavour. I like it to be opaque and dark in hue. The commercial marmalade that comes nearest to my ideal is Frank Cooper’s Oxford marmalade, first made in 1874. According to legend, a recipe was brought from a Perthshire manse by an Oxford don and presented to Mrs Cooper, the wife of a grocer in the city. She made a few pots which were immediately snapped up and such was the demand that in 1903 a marmalade factory was built opposite Oxford station. Few people have time for breakfast these days, and the main market for marmalade is among people like me. Mrs Janet Cooper makes our marmalade every January and I relish the smell as it steams away in the jam pan. It is a luxury well worth preserving. According to Anne Wilson, some European Union member states want the term “marmalade” replaced by “orange jam“. How right she is when she urges us to continue the fight to save the name and identity of marmalade.